The rise of Donald Trump is a direct threat to the pope’s message of compassion and openness. 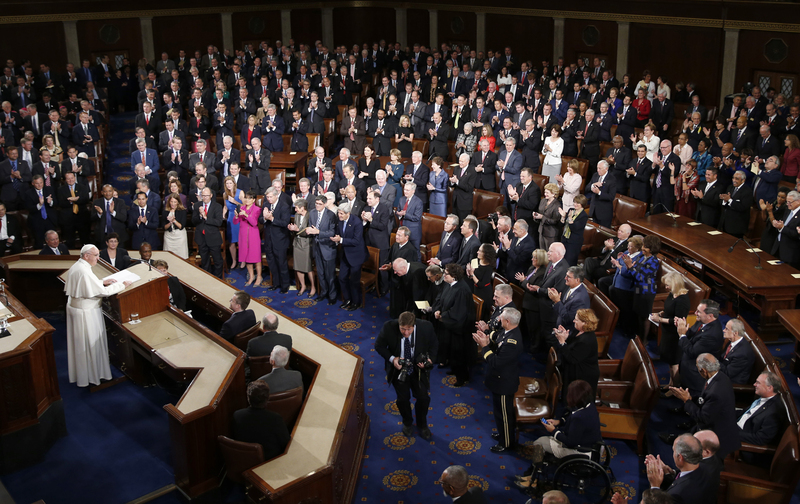 One year ago, the pope addressed Congress for the first time in history. He told our political leaders: “You are called on to defend and preserve the dignity of your fellow citizens in the tireless and demanding pursuit of the common good.” He tried to inspire our better angels. The pope’s call still rings true in the hearts of many, Catholic and non-Catholic alike. He gave us words to live and work by. He reinforced the values working people embody every day. In the labor movement, we know we are stronger and better when we come together. As the pope noted, the rules that guide our democracy have too often divided us. And for too long, politicians have tried to convince us that the economy is like the weather—out of our control. In fact, the economy is nothing more than a set of rules, written by the men and women we elect. By standing together to change those rules, we can expand opportunities for workers and their families, lift up communities, and create an economy that is fair and just. Every few years, we get to choose the people who write the economic rules and set the direction of our nation in the process. That’s why this election is so important. Pope Francis urged us to create an inclusive, sustainable economy, to share in justice and peace, to recognize that we must constantly relate to others and to reject a mindset of hostility. The pope rightly does not engage in electoral politics. But it is impossible to ignore the fact that Donald Trump’s campaign is an insult to Pope Francis’s vision of community and abundance. Trump sees the economy as a scheme where someone must win and someone must lose—a zero-sum game. He wants our country to build walls, both figuratively and literally, to shut out the people he deems inferior. And most disturbingly, Donald Trump deals in insults and hate—inspiring fear, division, and worse. The rise of Trump is a direct threat to the pope’s message of compassion and openness. He has called into question whether America is one community, a nation that says you are mine and I am yours. He has condemned “the strangers” among us and rejected the refugees the pope asked us to bring into our hearts and homes. But even on the darkest of days, I have never lost faith in the moral fabric of our nation. We are a resilient people. We came back stronger from the ashes of September 11. We’ve endured recession and natural disaster and senseless violence. In the face of tragedy and tribulation, we’ve deepened our embrace of the values that make us exceptional. This campaign season, the contrast is clear. And we will rise to the challenge. Our labor movement is mobilizing and organizing. We are advancing issues and policies that help working families. And we are working to elect leaders committed to creating a nation of justice and peace, and an economy that shares in the prosperity we all help to create. A year has passed, but the pope’s message is more relevant than ever. Let’s lock arms and lift up our families and communities. Let’s work together toward that greatest common good. Richard TrumkaRichard Trumka is president of the 12.5 million member AFL-CIO, America’s largest federation of labor unions.